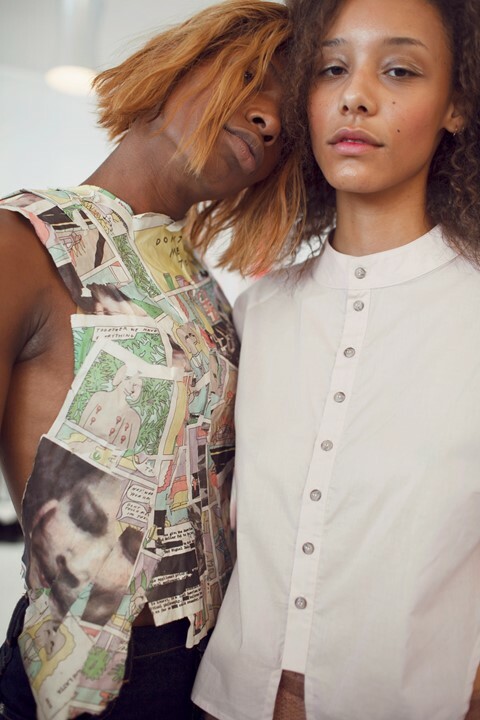 Eckhaus Latta is a label well versed in the medium of fashion film. After creating an almost NSFW short as part of their AW15 campaign, the design duo have rekindled their relationship with moving image, breaking the fourth wall and exploring the false nature of photo shoots in their latest short. Appropriately named SMILE, the nearly three minute film is described by the duo as portraying a family dynamic as, “an emotionally complex branding mechanism.” Originally planning a straight-up shoot to show off the brand’s SS16 collection, the pair became increasingly interested in the inherent and unavoidable artifice of advertising and editorial images. Exploring inbetween moments often only caught off camera, models pose awkwardly as a family in a squeaky clean show home, displaying a sense of forced emotion and initiating comment on the often highly constructed nature of the imagery we consume. “It was a nice way for us to reconsider the collection — after we’ve had time to look at the clothing for a period of months, compared to a live show, where it’s really us experiencing the collection for the first time as the public does,” Eckhaus told the New York Times. Doubling up as the duo’s contribution to the Hammer Museum biennial, Made in LA 2016, the film sees the brand (who are scheduled to show their next collection at NYFW later this month) team up with regular collaborator, German filmmaker Alexa Karolinski, once more.